Take a trip to tropical paradise with this delicious and highly nutritious fruit smoothie. Loaded with antioxidants, vitamins, and minerals, this recipe is a great way to start your day, or as a healthy snack or dessert. All of the ingredients in this smoothie are healthy, but acai is in a class of its own as a legitimate superfood. While researching the health benefits of acai I came across one article that thoroughly encapsulated the magic of this super berry. It’s by Dr. Edward F. Group III, DC, ND. Below is his list of the top 12 health benefits, to read the full article, see 12 Health Benefits of Acai Berries. Not bad for a little purple berry from the rainforest. BTW, buying acai (and cacao) helps support the rainforests. I like acai juice and powder, but prefer frozen acai puree for my smoothies. 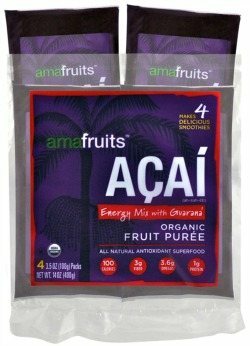 The best brand I’ve come across for the acai puree is amafruits.com. I hope you enjoy this smoothie as much as I do. I’d love to know if you tried this tropical acai smoothie – please do tell in the comments below. Happy Blending!